The TSR adopt-me page showed a photo of a sheltie with a filthy, overgrown coat & a 9-inch long black tumor growing out of the top of her head. "That's our next dog," said my wife, Shari, perhaps knowing that a forever home for Kenzie was a longshot. A veterinarian restored her to good health, commenting that this dog, with her coat stinky & full of parasites, is "a diamond in the rough." Shari brought Kenzie home to Chapel Hill in June 2010, her life as an abandoned stray on the streets of Fayetteville now ended. A diamond, indeed! Kenzie grew to be a gem that caused pedestrians to stop & comment on her beauty, to ask her name, her age, etc. Kenzie loved people & the attention they gave her. Other dogs were a different matter; she gave them a wide & fearful berth, likely a result of her rough life on the streets. 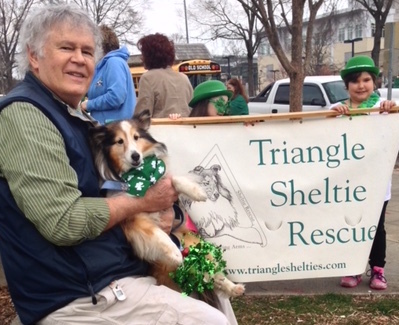 In March 2013, Kenzie & I marched with the TSR platoon in Raleigh's St. Patrick's Day parade, & I could hear comments from the crowd as they pointed out to each other the beautiful little dog on the orange leash at the front of the group. Kenzie knew nothing of this pleasing effect she had on people, of course, & she couldn't care less. Just pat my head, scratch my ears, look into my eyes -- & we're friends for life! I just finished posting Bill's beautiful and heartfelt tribute to his wonderful friend, Kenzie, and was moved to add our tribute to this wonderful little girl. My wife and I were fortunate to be Kenzie's foster home before Bill and Shari blessed her with a wonderful forever home. I can say without a doubt, she had a loving and kind soul, one you knew by just looking in her eyes. You could tell that she was grateful knowing that her life had just been upgraded when she came to us and eventually her forever parents. Kenzie was in bad shape when she came to Triangle Sheltie Rescue. Like Bill states, she had "a filthy, overgrown coat & 9-inch long black tumor growing out of the top of her head." She had every right to be an angry and bitter, but despite all that she had been through, she was still a happy little girl that was ready to get past her past and get on to a loving family. Susan and I, along with Triangle Sheltie Rescue, were compelled to run a fund raiser to get her the medical attention she needed. Thanks to some very generous friends, we succeeded in getting her tumor removed, her hair restored to what it should have been all along and getting her to that perfect and loving family she richly deserved. Kenzie was one of our favorite fosters. There was something about her when you walked into a room and see that she was happy to see you. We looked forward to those times when Bill and Shari asked us to babysit her when they traveled. She was always welcome to return to her foster home and always hard to give back to them when they returned. But we understood. She needed to be back with those to whom she belonged.